People enter Cotswold School in Charlotte, N.C., to vote Nov. 4, 2014. North Carolina’s voting-rights law goes on trial July 13, 2015. Monday marks the start of a pivotal voting-rights trial in North Carolina. On the line? Access to the ballot box for tens of thousands of African-American voters. Calling the trial its “Selma,” referencing the Selma-to-Montgomery marches of 1964 in Alabama, the North Carolina State Conference of the NAACP is taking Gov. 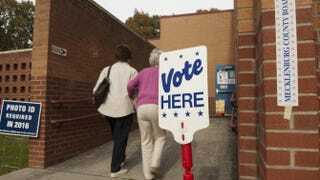 Pat McCrory to court for signing into law what many have called one of the strictest voting laws passed in the country. Back in 2013—in the wake of the Supreme Court’s Shelby v. Holder decision, which gutted portions of the Voting Rights Act—the North Carolina Legislature passed H.B. 589, a voter-suppression law that drastically changed or wiped out many provisions meant to encourage voter turnout and provide easier access to the ballot box. The law instituted a voter-ID requirement, shortened early voting by a week, got rid of same-day registration, expanded the state’s ability to challenge voters, killed a preregistration program for 16- and 17-year-olds, and disallowed the counting of provisional ballots cast out-of-precinct, among other changes. Critics say that these restrictions disproportionately affect African Americans. According to state data, back in 2012, 70 percent of black North Carolina voters used early voting, and while blacks only make up about 22 percent of the voting population in the state, they accounted for 41 percent of voters who took advantage of same-day registration. African Americans also made up 30 percent of those who cast ballots out-of-precinct. Last year, these laws directly impacted the midterm elections, with reports of between 30,000 and 50,000 being ineligible to vote because of the law. Three weeks before the start of trial, the state Legislature actually made changes to the voter-ID law, relaxing some provisions. According to representatives with the North Carolina NAACP, which is spearheading the lawsuit, this means the voter-ID portion of H.B. 589 will likely be argued at a later date. But the rest of the law remains in contention and will be discussed this Monday at the start of trial in Winston-Salem, N.C. The trial is expected to last two weeks. After the first day of testimony, the North Carolina NAACP and the Forward Together Moral Movement are leading a mass march through Winston-Salem, starting at 5 p.m.